SPECwpc is the first benchmark to measure all key aspects of workstation performance based on diverse professional applications. 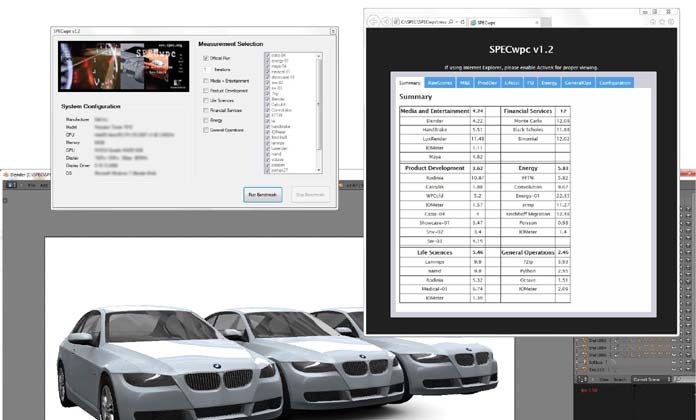 The latest version is SPECwpc V1.2 (introduced on June 3, 2015), which extends performance measurement from physical to virtualized workstations. Results from SPECwpc V1.2 are comparable to those from SPEC V1.0.4, but not to any version before that. SPECwpc members at the time of V1.2 release include AMD, Dell, Fujitsu, HP, Intel, Lenovo, Micron and NVIDIA. More than 30 workloads are included in SPECwpc V1.2 to test CPU, graphics, I/O and memory bandwidth. The tests are divided into the application categories listed below. Individual scores are generated for each test and a composite score for each category is generated based on a reference machine, yielding a "bigger is better" result. The reference machine has the following configuration: x3430 processor, 8GB (4x2GB) memory, V4800 graphics and SATA 7.2k rpm hard-disk drive. The benchmark does not require the full application and associated licensing to be installed on the system under test, simplifying set-up, running and results reporting. The SPECwpc benchmark can be used by vendors to optimize performance and publicize benchmark results for different vertical market segments. Users can employ the benchmark for buying and configuration decisions specific to their industries. SPECwpc V1.2 is available immediately under a two-tiered pricing structure: free for non-commercial users and $5,000 for commercial entities. Commercial entities are defined as organizations using the benchmark for the purpose of marketing, developing, testing, consulting for and/or selling computers, computer services, graphics devices, drivers or other systems in the computer marketplace. NOTE: An internal error in SPECwpc V1.2 and earlier might affect the scores for the LifeSci and Energy composites by up to 5%. Due to an error in the way clipping planes are handled, results for configurations containing certain high-end graphics cards are abnormally high for tests 5 and 7 of the energy-01 dataset and marginally higher for tests 5 and 10 of the medical-01 dataset. No other datasets are affected. This bug will be fixed in the upcoming V2.0, slated for late Summer or early Fall of 2015. More information.